Much like the rest of the 20-something white girl population, pumpkin is my favorite fall flavor. October is a highly anticipated month as I count the days towards what I officially call “Pumpkin Season.” Granted, this date is completely arbitrary, but since Bozeman summer generally extends well into September anyway, October 1st seemed a good choice. These would be a great way to kick off Halloween morning, sharing them with family, friends, or coworkers. Like many of you (I’m guessing), I already attended a Halloween party this past weekend, but maybe there’s a day-of party happening Thursday, or you just want to make something easy this fall. 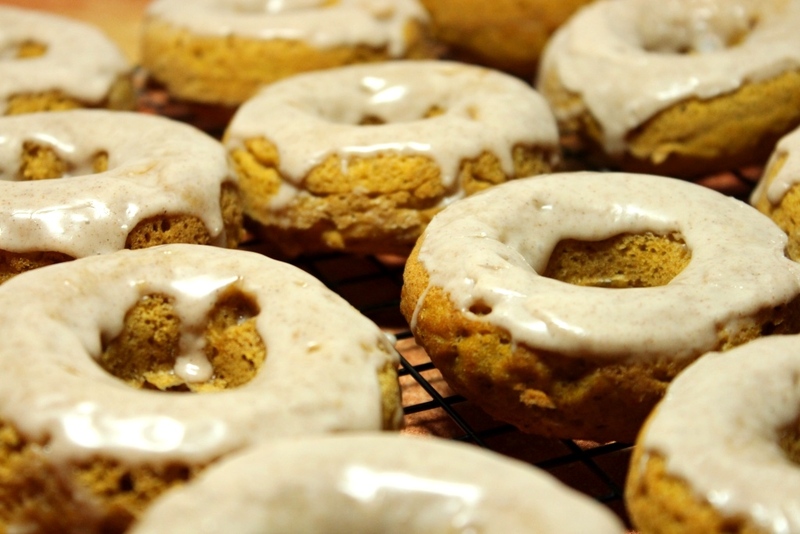 Whatever the occasion, these donuts are an easy way to bring the pumpkin flavor to breakfast. Did you have a costume this year? 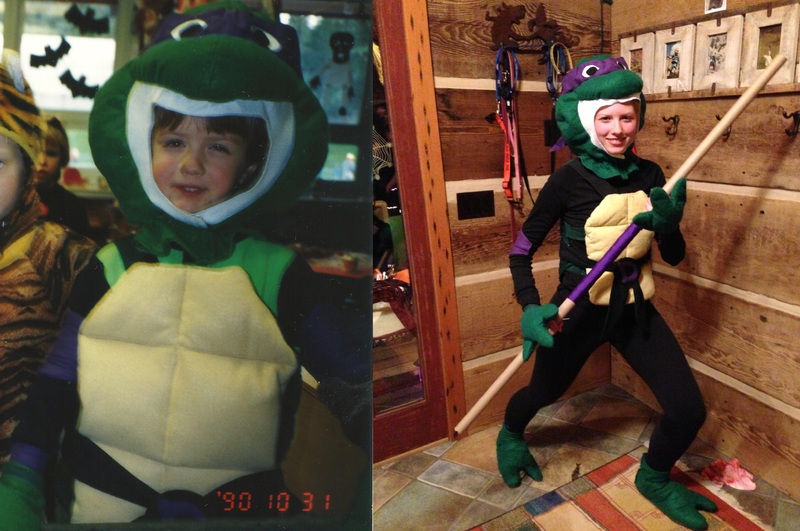 I dressed up as Donatello (the Ninja Turtle, not the Renaissance artist), using a costume my mom made my older brother when he was five. That makes this costume almost as old as me, but still amazingly awesome. Heroes in a half shell – Turtle Power! Preheat your oven to 350 degrees Fahrenheit. Butter a donut pan and set aside. In a small bowl, whisk together flour, baking powder, baking soda, salt, cinnamon, nutmeg, and ginger. Using an electric mixer on medium speed, beat together brown sugar, butter, and pumpkin until thoroughly combined. Add eggs, mixing well, and then stir in milk and vanilla until completely incorporated. Stir in the dry ingredients, mixing until just combined. Spoon batter into a large Ziploc or pastry bag, cut off the tip, and pipe into the buttered donut wells. Bake for 10 minutes, or until a toothpick comes out clean. Cool in the pan five minutes, then remove to a wire rack to cool completely. For the glaze, whisk together the remaining ingredients in a small bowl. Dip cooled donuts in the glaze and return to the wire rack to set. Enjoy with a glass of milk or a mug of coffee, and a few friends to help you eat them. 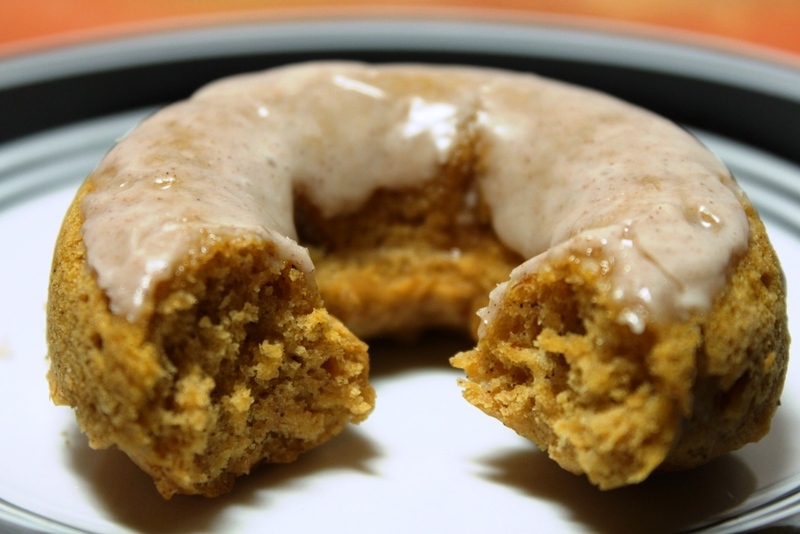 1 These taste great made a day in advance, but the glaze tends to soak into the donut. If you can, glaze them on the day you intend to serve them so they’ll stay nice and pretty.